As a partner at McAlvey, Merchant & Associates, Rusty brings more than 20 years of political and public policy experience to the firm. Rusty is recognized as a leading lobbyist in Lansing and has strong relationships across the state. 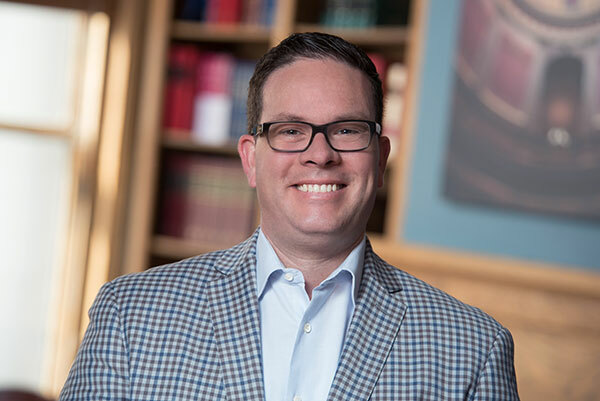 Prior to joining the firm in 2003, Rusty served as Vice President for Public Policy and Government Affairs at the Grand Rapids Area Chamber of Commerce. There, he was responsible for advocacy at the local, state and federal levels, as well as elevating the Friends of West Michigan Business into one of the top Political Action Committees in West Michigan. Before his role at the Chamber, Rusty served in the Office of Majority Floor Leader Andrew Raczkowski (R-Farmington Hills) where he served as Chief of Staff from August of 1997 to March of 2000. He provided support for the Representative on the House floor and oversaw day-to-day operations of a leadership office. Floor duties included scheduling legislation, coordinating parliamentary procedure, assisting members in moving legislation through the process, and serving the needs of the Speaker of the House. Rusty began his career as a Legislative Aide to the late State Senator Douglas Carl (R-Shelby Township) where he managed the Senator’s legislative priorities and served as the chief aid to the Senate Finance Subcommittee to Combat Cigarette Smuggling. He was instrumental in creating and passing legislation (recommended by the subcommittee) that has garnered tens of millions of dollars of lost revenue to the state School Aid fund. Rusty is a graduate of Grand Valley State University where he received a B.S. in Public Relations. He also received his Associates Degree from St. Clair County Community College and briefly attended Liberty University in Lynchburg, Virginia. Rusty has served on the Board of Directors for the YMCA, Ridge Park Charter Academy, the Kent County Community Corrections Advisory Board, Ele’s Place Governing Board, and was elected four times to the Grand Rapids Township Board of Trustees. Rusty was also identified in Grand Rapids Magazine as one of the top 20 community leaders under 40 to watch in West Michigan. Rusty and his wife Jenn live in Lowell, Michigan and have three children, Peyton, Gavin, and Grayson.